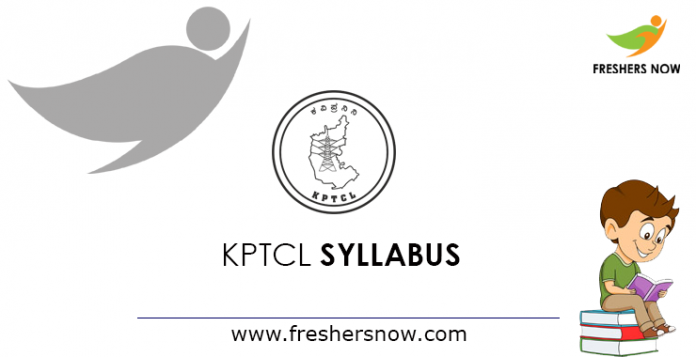 Download the KPTCL Syllabus 2019 PDF for both NHK and HK Posts. Since the Board members of the Karnataka Power Transmission Corporation Limited is recruiting for Non-Hyderabad Karnataka & Hyderabad Karnataka Posts such as Assistant Engineer, Junior Engineer, Assistant Executive Engineer, Junior Personal Assistant, Junior Assistant. So, get complete information about the KPTCL Exam Pattern 2019 and the KPTCL Selection Process 2019. Mostly, many candidates are looking for the KPTCL Assistant Engineer Syllabus 2019 as well as the KPTCL Junior Engineer Syllabus 2019. Check them all from the below sections. We had collected complete details and furnished here for the sake of the candidates. Therefore, it makes an individuals process easier in finding the KPTCL Syllabus 2019. So, go through the entire post to get detailed information for each and every post. The KPTCL Selection Process 2019 for the KPTCL NHK & HK Posts will be the same. There will be a Kannada Language Test for all the applied candidates. Hence after getting the results, the selected candidates from the Kannada Language Test, they are asked to attempt the Common Aptitude Test. 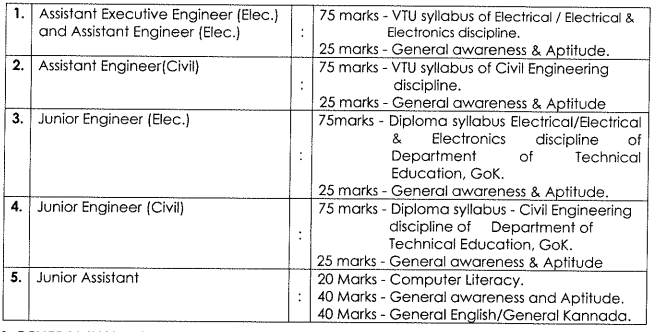 Candidates can get the Syllabus for the Aptitude Test for all Assistant Engineer, Junior Engineer, Assistant Executive Engineer, Junior Personal Assistant, Junior Assistant is given clearly in the below sections. Kindly check them and get ready to take the examination very soon. The Exam Pattern for the NHK & HK Posts is given clearly by the Recruiters of the ಕರ್ನಾಟಕ ಪವರ್ ಟ್ರಾನ್ಸ್ಮಿಷನ್ ಕಾರ್ಪೊರೇಶನ್ ಲಿಮಿಟೆಡ್ at the time of notification only, We had collected the details form the Official notification and furnished here in this section in the form of KPTCL Exam Pattern 2019. Moreover, the exam pattern will give you the details like a number of marks given for each question from each subject. Also, the time duration will be known. Down Here you can get the KPTCL Assistant Engineer Syllabus 2019 and the KPTCL Junior Engineer Syllabus 2019. There will be negative marking and 0.25 marks will be deducted for each wrong answer. Candidates should take the Kannada Language Test at Bengaluru only. Aspirants who are getting ready to take the examination very soon conducted by the selection committee of the Karnataka Power Transmission Corporation Limited. Also, we had collected all syllabus details and furnished here additionally, in such a way, that the aspirants can understand in an easy way. Hence download the KPTCL Junior Engineer Syllabus 2019 and the KPTCL Assistant Engineer Syllabus 2019 from the link inserted at the end of the page. Therefore, improve your skills in each and every topic given here in the KPTCL Syllabus 2019 PDF. Similarly, for more updates and information like this, visit our website Freshers Now regularly. Thank You!! !